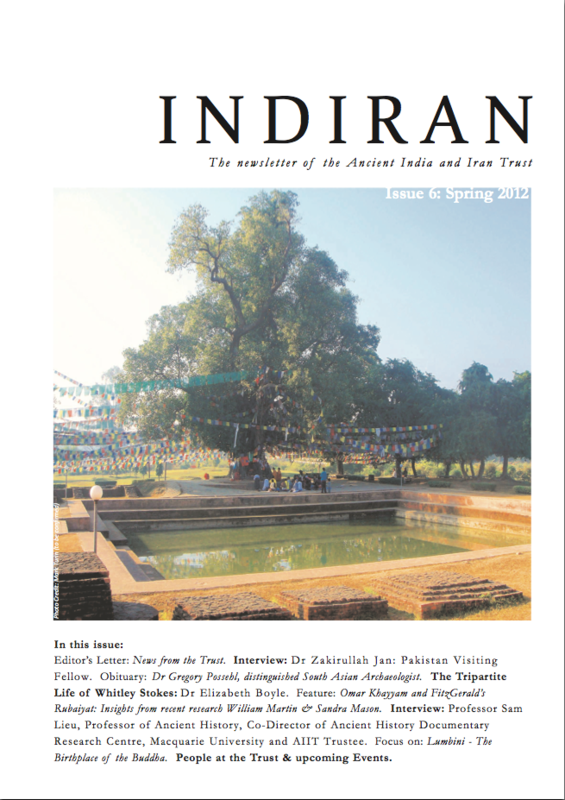 A new issue of the Ancient India & Iran Trust’s newsletter, INDIRAN, is now available. This issue includes interviews with one of the Trust’s newly appointed Trustees and long time supporter of the AIIT, Professor Sam Lieu and our previous Pakistan Visiting Fellowship recipient, Dr Zakirullah Jan. There is an excellent piece on Whitley Stokes, by Dr Elizabeth Boyle and Dr Paul Russell, who gave our final Friday lecture before Christmas and a review of two fascinating new books on FitzGerald’s Rubaiyat, by the Chairs of our Friends of the Trust, Bill Martin and Sandra Mason. Also in this issue, we remember the late Dr Gregory Possehl, former Trustee, distinguished archaeologist and expert on the rise of the Indus civilisation.